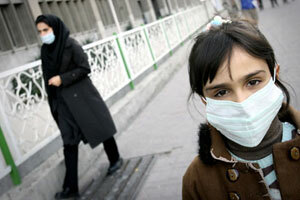 NCRI - Every week 52 persons die of air pollution in Tehran. The air pollution in Tehran has become a danger for the lives of millions of residents in this city, especially children, elders and sick people. Based on figures published by official sources, every year 2700 persons die of pollution in Tehran meaning 52 a week. The most polluted parts of Tehran are districts 3 and 8 and Shahre Ray, which have double the amount of pollution than other places. Reports have also emerged that air in Isfahan Province has become unhealthy. The weather forecast in Isfahan indicate that a stable atmosphere is going to remain over the city for 2 days causing the density of the air pollution in Isfahan to increase. This contaminated and polluted air has caused lung and heart problems and cases of cancer among people.